Our human iPSC-derived cardiomyocytes allow scientists to build their own human cellular models to accelerate their research. The use of iPSC-derived cardiomyocytes as an in vitro research model provides a major advantage over primary cells in that they provide a continuous source of cardiomyocytes from the same genetic background for use in multiple experiments. Our human cardiomyocytes derived from iPS cells are ideal for use in cardiotoxicity testing, drug screening, drug validation as well as metabolism studies and electrophysiology applications. Once thawed, our cardiomyocytes will soon begin to spontaneously beat in vitro and are characterized by the expression of cardiac-specific markers, including cardiac troponin (see the data below). We also provide a fully-defined culture medium and coating reagents optimized for use with the cardiomyocytes for maximal recovery and viability for experiment assays. Maintain pure cultures for long-term experiments. Validated on Fibronectin, Vitronectin, and Matrigel substrates. Axol Human iPSC-Derived Ventricular Cardiomyocytes were cultured in Cardiomyocyte Maintenance Medium prior to being fixed and stained for the markers Sarcomeric Alpha Actinin and Cardiac Troponin. The cells were counterstained using DAPI to allow visualization of nuclei. In a study by Christian Zuppinger at the University of Bern, Axol ventricular cardiomyocytes were cultured for 10 days then fixed and stained for a number of markers. In the image to the right, the cardiomyocytes were stained for the sarcomeric marker myomesin, which labels the M-line of sarcomeres in all species and all actin. 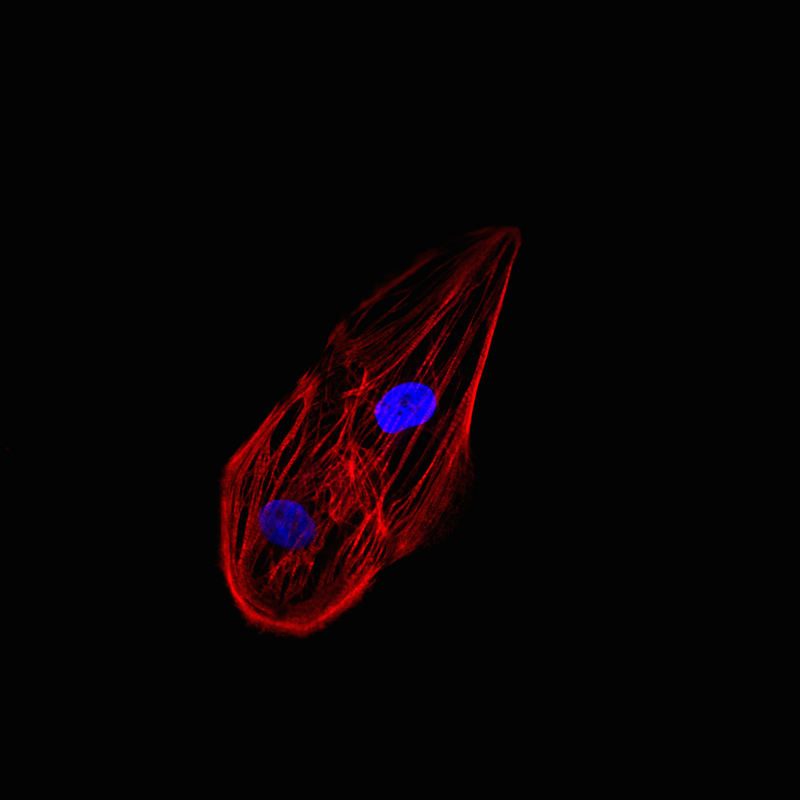 The cells were counterstained using DAPI to allow visualization of nuclei. The results demonstrate that there is good sarcomere differentiation in these cells and the majority of cells are positive for muscle proteins. In a later study, the ventricular cardiomyocytes were cultured for two weeks during which they formed a closed carpet in 2D culture. The image on the left shows the expression of the beta-myosin heavy chain and all actin in the cardiomyocytes. The cells were also counterstained with DAPI to visualize the nuclei. Christian Zuppinger, University of Bern. December 2015. Many thanks to Christian Zuppinger for sharing both his expertise and the data he generated using Axol Human iPSC-Derived Ventricular Cardiomyocytes. Ventricular cardiomyocytes were fixed after 10 days in culture and stained for the gap junction protein connexin-43 and all actin. Connexin-43 was found to be expressed by all cells as shown in the representative images. 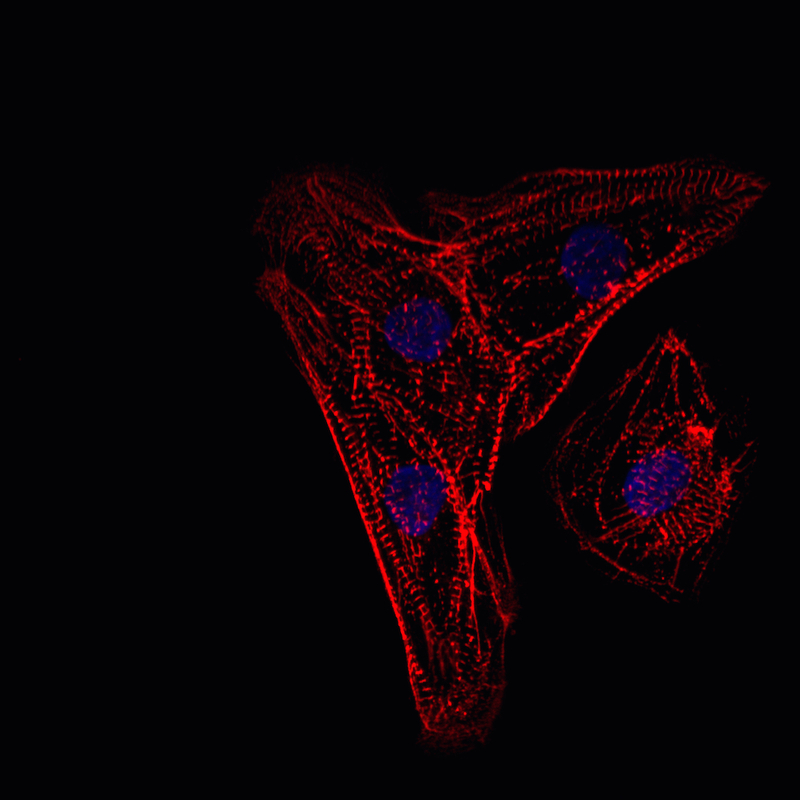 Ventricular cardiomyocytes were coimmunostained for Telethonin, Actin and DAPI counterstain. Ventricular cardiomyocytes were coimmunostained for Ankyrin repeat domain 1 (ANKRD1), Actin and DAPI counterstain. Axol iPSC-Derived Atrial Cardiomyocytes express atrial natriuretic peptide (ANP) and atrial myosin light chain 2 (MLC2a) both of which play a role in the response and regulation of atrial stretching and contractility. Expression of Troponin T, atrial natriuretic peptide (ANP) and atrial myosin light chain 2 (MLC2a) was confirmed in Axol iPSC-Derived Atrial Cardiomyocytes using immunocytochemistry. Troponin T staining (red) confirmed the presence of cardiac myocytes which are responsible for sarcomere contraction. ANP is specifically secreted by atrial myocytes upon atrial stretching and MLC2a facilitates cardiac contractility wo. DAPI counterstain. In this video you can see how Axol Human iPSC-Derived Ventricular Cardiomyocytes begin to spontaneously beat after just 7 days in culture following thawing! In this video you can see Axol’s atrial cardiomyocytes begin to beat spontaneously after just 5 days in culture. In this video you can see Axol’s Human iPSC-derived Atrial Cardiomyocytes beating in a synchronous monolayer after 8 days in culture. Axol’s Human iPSC-Derived Ventricular Cardiomyocytes display spontaneous action potentials and are suitable for pacing experiments. Characteristics of spontaneous and evoked action potentials recorded from Axol’s Human iPSC-derived Ventricular Cardiomyocytes. Spontaneous (A) and evoked (1 Hz; B) action potentials recorded by whole-cell patch clamp. (C) Average action potential parameters for spontaneous and evoked action potentials in control conditions. Profiling the pharmacology of Axol’s Human iPSC-Derived Ventricular Cardiomyocytes by patch clamp electrophysiology reveals the presence of three core cardiac ion channels, INa, ICa,L and IKr. Axol’s Human iPSC-derived Ventricular Cardiomyocytes express the core cardiac ion channels INa, ICa,L and IKr. (A) Representative traces of evoked action potentials recorded under control conditions (grey) and in the presence of 100 μM Lidocaine (green), 100 nM Nifedipine (blue) or 50 nM Dofetilide (red), which show expected effects on action potential amplitude and duration. B) Average effect of each compound on spontaneous action potential parameters, presented as percent of control ± SEM, N ≥ 4. Statistical significance calculated by a paired two-tailed Student’s t-test (* p<0.05, ** p<0.01, *** p<0.001). Axol’s Human iPSC-Derived Atrial Cardiomyocytes elicit spontaneous action potentials and are suitable for pacing experiments. Characteristics of spontaneous and evoked action potentials from Human iPSC-Derived Atrial Cardiomyocytes. Representative traces of spontaneous (A) and evoked (1 Hz; B) action potentials recorded by whole-cell patch clamp. (C) Average action potential parameters. Patch clamp characterization of the pharmacological profile of Axol’s Human iPSC-Derived Atrial Cardiomyocytes reveal the presence of three core cardiac ion channels, INa, ICa, L and IKr. 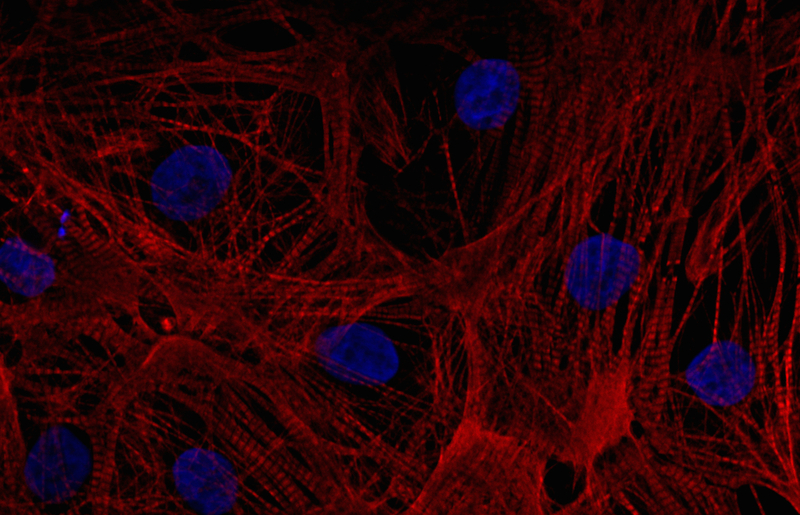 Axol’s Human iPSC-Derived Atrial Cardiomyocytes express functional core cardiac ion channels, INa, ICa,L and IKr. Lidocaine (INa), Nifedipine (ICa,L), and E-4031 (IKr) were used to characterize the activity of core cardiac currents during iPSC-derived atrial cardiomyocyte action potentials. Each trace shows representative spontaneous action potentials under control conditions (grey) and in the presence of 100 μM Lidocaine (A, green), 100 nM Nifedipine (B, blue), and 100 nM E-4031 (C, red). C) Early afterdepolarizations (EADS) were observed after application of the hERG blocker E-4031 (arrow), indicative of arrhythmic activity. D) Average effect of Lidocaine, Nifedipine, and E-4031 on atrial action potential parameters (% of control) (N=4). Human iPSC-derived Atrial Cardiomyocytes are sensitive to modulators of the atrial-specific ion channels Kv1.5 (which underlies the ultra rapid potassium current, IKur) and Kir3.x (constituents of the G protein-activated inwardly rectifying potassium current, IKACh). Atrial cardiomyocyte phenotype was confirmed by the modulation of spontaneous action potentials using selective pharmacological compounds. Representative spontaneous action potentials are shown under control conditions (grey) and after the application of 50 μM 4-AP (A, blue) or 1 μM Carbachol (B, orange). The bar graphs show the average effect (% of control) on action potential parameters (N=5). A low concentration of 4-aminopyridine (4-AP) selectively inhibits the IKur current to broaden action potential duration and slow spontaneous firing (A). Carbachol was used to activate the IKACh current, resulting in action potential shortening and profound slowing of firing frequency (B). Metrion Biosciences used their ion channel expertise to kindly provide all electrophysiological characterization of Axol’s iPSC-derived Atrial and Ventricular Cardiomyocytes. Axol Human iPSC-Derived Ventricular Cardiomyocytes can be used in calcium imaging assays as shown in this video. The data were provided by Dr Frances Brook and Dr Yu-Fen Chang, Oxford University. The cardiomyocytes were plated and cultured for seven days in Axol Cardiomyocyte Maintenance Medium, and then replated on Fibronectin/Gelatin (0.5% / 0.1%) coated plates for final analysis. 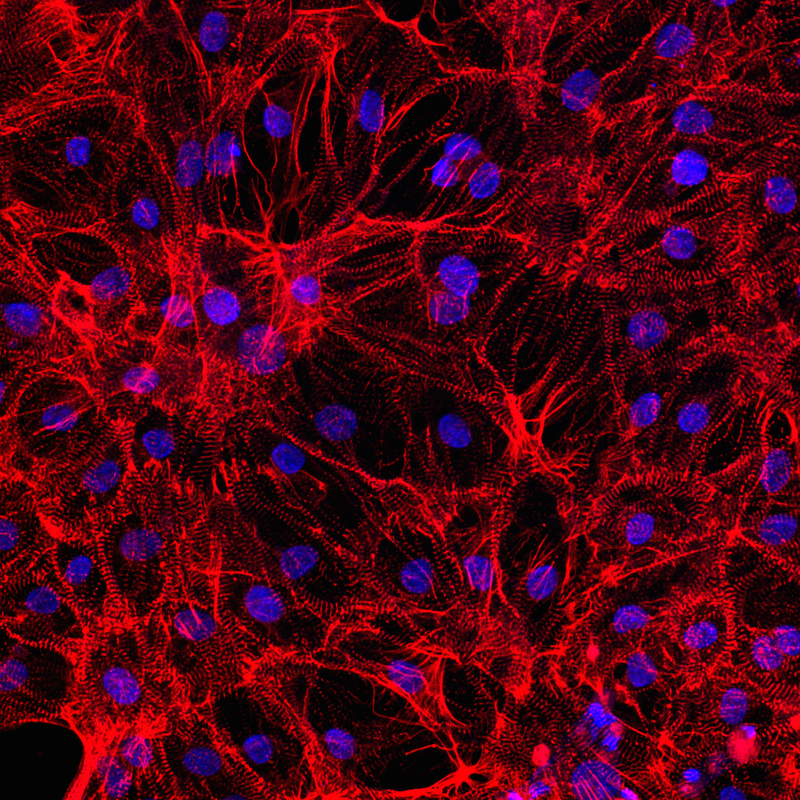 Axol’s Human iPSC-Derived Ventricular Cardiomyocytes were treated with doxorubicin (control, 500 nM, 100 nM and 50 nM). There was a dose-dependent response at 13 h and 24 h post-treatment with doxorubicin. Arrhythmias and loss of beating amplitude were seen at lower doxorubicin concentration, whereas higher doxorubicin concentrations resulted in tachycardia and ultimately cell death. Data kindly provided by Dr J. Maynes, University of Toronto.